We JRS Farmparts are leading manufacturer and exporter of all types of Parking Jacks (Soporte, BEQUILES , Suporte ) in India. 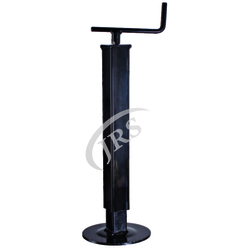 With rich industry experience and knowledge, we are offering a qualitative range of Trailer Jacks. These jacks are manufactured from qualitative raw material by our experts. We provide these products to our customers at market leading prices. H.D. 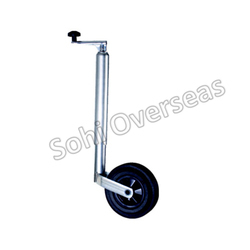 Trailers Private Limited is the leading Exporter Manufaturer and Supplier of Trailer Landing Leg . Sketch showing electric controls on tail wheel jack. Control tube at left has hook on bottom which shuts off power when jack is extended and bar which bottom fitting strikes when jack is retracted. Avail from us trailer jack, which is acknowledged for its heavy duty. These are manufactured using sq. FRW pipe, which has nut welded of the bottom to accommodate lead screw, the and thread are provided for the heavy duty use of jack is fixed with the channel of trailer. The capacity of our trailers is around 900kg. and allows an upward movement of 200mm. This can be indexed at 90'. all hydraulic jacks are tested hydraulically as per is specifications. using cylinder tubes are manufactured from cold drawn seamless tubes, having required surface duly finished to ensure longer life of oil seal. rubber oil-seal to resist high fluid pressure. this jack is used to lift the tractor trailer for unloading purpose. Our organization instrumental in designing and offering an industrially verified range of Tractor & Trailer Hydraulic Jacks that is ideal for maintenance, positioning, lifting and lowering applications. We offer a wide range of Tractor & Trailer Hydraulic Jacks that is widely used in many industries. The Hydraulic Trailer is manufactured using optimum quality materials ensuring high durability, tensile strength and resistivity to adverse conditions. The Hydraulic Jack Trailer is provided with one duel openable panels on the rear for loading / unloading the material on the trolley. In order to cater the variegated demands of our precious clients, we have come up with a quality assured range of Tractor Trailer Hydraulic Jack. - ACME threaded screw design. - Reflective collar and safety yellow painting. Swivel head: 40" to 51"
Design: Swivel head adjusts from 40" to 51"